Imagine being at the show, Who Wants to Be A Millionaire! Enjoy a similar experience on Slingo Who Wants to Be A Millionaire at Vegas Spins. It is a game crafted by Gaming Realms, combining bingo with slots. It is endowed with a 5x5 grid containing several boxes. At the bottom of the grid, you can see a reel which can be spun. During your gameplay, find different numbers and symbols related to the popular gameshow. Create a Slingo by marking off 5 numbers in a row and each time you do so, you can reveal a symbol with a prize amount attached to it. Don’t miss the fixed jackpot as well! Play this lucrative game on any kind of device. Be ready for the fun on Slingo Who Wants to Be A Millionaire! Begin by selecting a stake of your choice. Click on “Start Game” to launch the single slot reel found at the bottom of the grid. You are at first offered 9 spins. Form a Slingo by matching 5 numbers on the grid in a row with those appearing on the reel. With each Slingo, a symbol with a prize value attached is revealed. If you collect 3 similar symbols, you can earn corresponding prizes ranging between £0.50 and £10,000. Bet Levels: Bet levels are not available on Slingo Who Wants to Be A Millionaire. Amount of Paylines Selection: There are no win lines on this game. Coin Values: Different stake values are available. Press the Stake button to set your preferences. If your 9 initial spins are over on Slingo Who Wants to Be A Millionaire, no need to worry! You can also buy an unlimited number of extra spins which allow you to continue playing and winning. 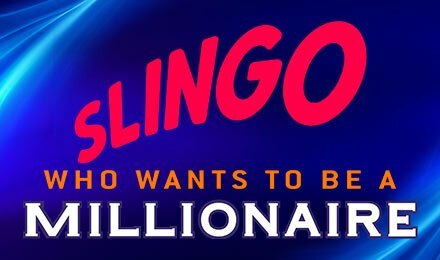 Manage to win a Full House in less than 7 spins to win up to 100,000x your stake on Slingo Who Wants to Be A Millionaire. You can thus expect a whopping jackpot of £1 million! Don’t miss the Jokers on the reel, since they speed up the game by marking off numbers on the grid. Launch Slingo Who Wants to Be A Millionaire at Vegas Spins and have plenty of fun. Good luck to you!